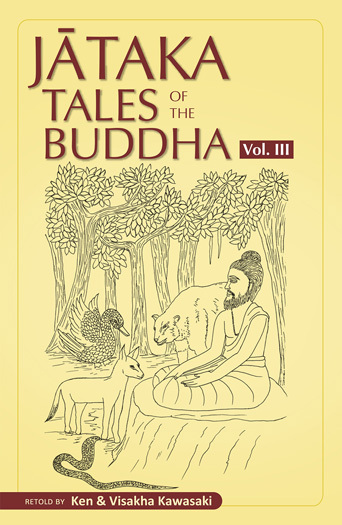 This Pariyatti Edition of the Jataka Tales of the Buddha - An Anthology Volume III, the second of three, contains 29 stories. The entire anthology contains 217 of the original 547 Jātakas. This is not a new translation from the Pali, but rather a retelling of the stories in modern English by Ken and Visakha Kawasaki. Whereas Western intellectuals seek the essence of Buddhism in its doctrines and meditation practices, the traditional Buddhists of Asia absorb the ideas and values of their spiritual heritage through its rich narrative literature about the Buddha and his disciples. The most popular collection of Buddhist stories is, without doubt, the Jātakas. These are the stories of the Buddha's past births, relating his experiences as he passed from life to life on the way to becoming a Buddha. At times he takes the form of a bird, at times he is born as a hare, a monkey, a prince, a merchant, or an ascetic, but in each case he uses the challenges he meets to grow in generosity, virtue, patience, wisdom, and compassion. This anthology of Jatakas, ably told by Ken and Visakha Kawasaki, remains faithful to the original yet presents the stories in clear and simple language. It thereby makes the Jātakas accessible even to young readers and to those for whom English is not their first language. I hope that this collection of Jātaka stories–entertaining, uplifting, absorbing, at times amusing, but always fascinating–will enable the modern reader to appreciate the impressive literary heritage of Buddhism and the simple beauty of its basic teachings.